This segment travels west-east on the lower slopes of Bunker hill through mixed-conifer forests of Douglas-dir, lodgepole and ponderosa pine. Lemolo Lake (to the south) is the largest reservoir in the North Umpqua Hydroelectric Project. The lake was formed in 1954 behind a 120-foot rock dam and covers 435 acres. 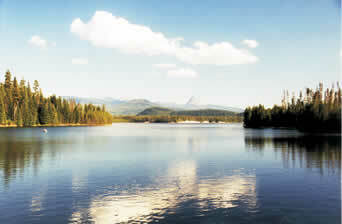 Lodgepole pine trees surround a small resort, day-use area, and four campgrounds. Panoramic views of the High Cascades (Mt. Thielsen) can be seen from the lake. Turn north on road 700 as it crosses the trail. In approximately 1/2 mile, you'll come to Crystal Springs and a dispersed campsite. The moss-covered springs demonstrates the high water sotrage capacity of the volcanic rock of the high cascades.